The devil is hungry as hell, and he’s ushered in the apocalypse until someone can sate his appetite. A humble soup cook is tasked with this challenge, but a tasty bowl of tomato soup clearly won’t be enough. Just when it seems like humanity is doomed, a sentient, mustached onion appears and opens a portal to the past. In order to save the future, the cook must travel through the ages to learn the ancient culinary arts required to appease the beast. No, this is not a wacky episode of Dr. Who. 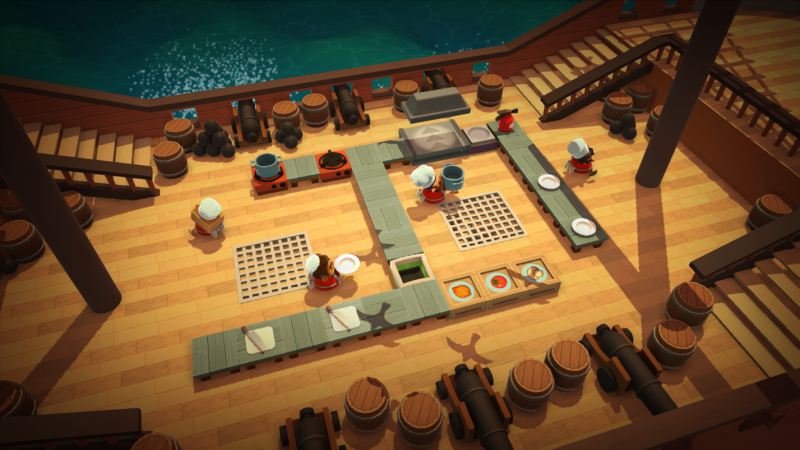 This is the story that unfolds in Overcooked, a couch co-op cooking game that is so fun and chaotic it can turn well-mannered people into buffoons blabbering about dirty dishes and meat needing to be chopped. Up to four cooks prepare, make, and serve meals for picky customers who all seem to want their food arranged differently; some people just want plain hamburgers, while others want the works. You need to pay attention to these orders and serve them before the customers grow angry. The goal on each stage is to complete as many orders as you can in a set amount of time. To prepare a dish, you must grab the ingredients from boxes, chop them up, cook them, and then put them on a dish. The controls are so simple and easy to grasp that two people can play the game on one controller (meaning you only need two controllers for a four-player round). The only “expert” technique that can potentially elevate your play is a dash move. Another button is rightfully designated to make your cook swear. 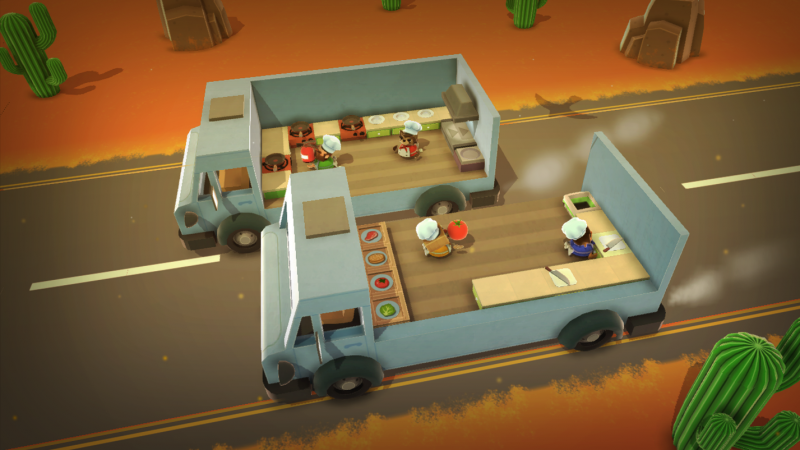 Even with the most basic set of moves to work with, Overcooked’s gameplay is frantic and a true test of speed and precision. It feels great when you get into a groove and you’re chopping onions like a champ, and feels awful when you accidentally throw your friends' beautifully made burrito in the trash. 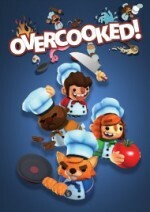 With four people working together in the kitchen, the game should be easier, right? 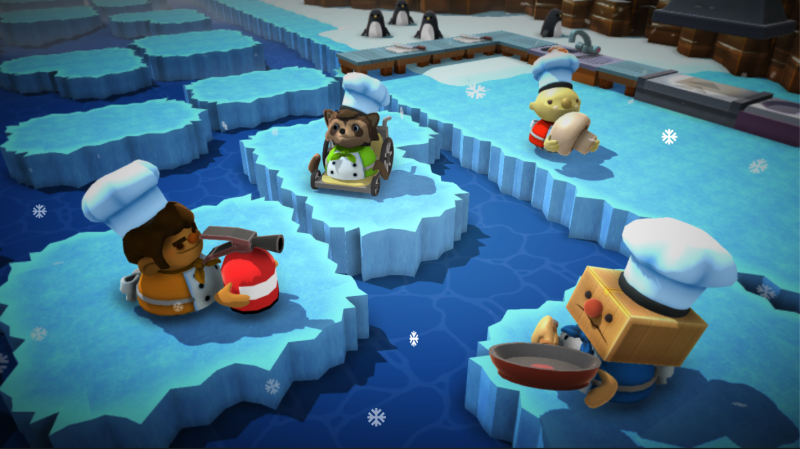 Even when players assign tasks to each cook and one person is designated as the head chef that calls out orders, most stages devolve into chaos, with people panicking, running into each other, and little being accomplished. That's what makes this game so damn fun. Your voices get louder as you play, and the music intensifies, making for a wild co-op experience. Part of the challenge comes from the kitchens; each is designed differently, and most seem to have a life of their own. You make fish and chips on slippery icebergs, hamburgers on pirate ships that sway so much that the counters move, burritos in haunted kitchens with floating ovens, and even pizza on space stations that rotate to cause confusion. Careful planning is required on each stage, and yes, you can formulate assembly lines that are effective to a degree. Sometimes it works best to have someone fetching ingredients, another chopping them, and the other two people handling the serving and cooking, but you never know what might happen in the kitchen. When food is in the oven, time is everything, as overcooked food will create a fire. Transforming kitchens can make assigned tasks difficult, or force you into different roles. The kitchens, as much as you’ll curse them at times, are one of this experience's key ingredients, and are just as much fun as the food-making process. 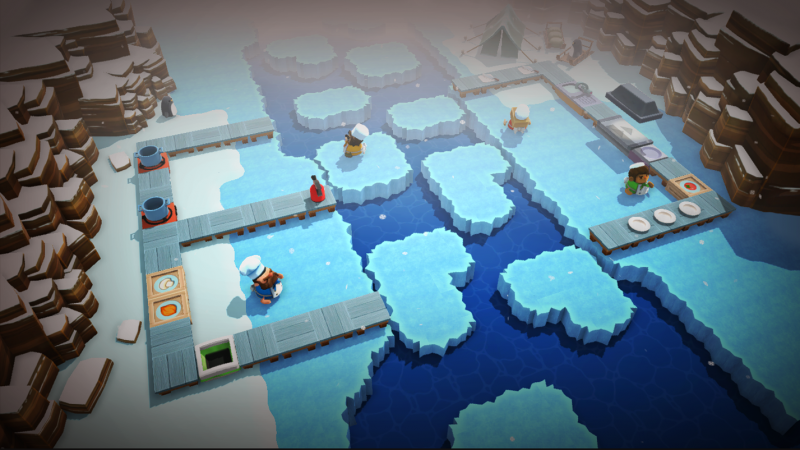 Overcooked’s biggest problem is balance. Although the game is immensely more entertaining with four people playing, it’s actually easier with fewer players, as the required point totals are lower. As boring as it is to play alone (which is sometimes handled by switching control between two cooks), it’s often the best way to earn three-star ratings. Stars are required to unlock additional levels, and you'll need to three-star most levels to reach the finale. We tried one stage a handful of times with four cooks, and always fell well short of three stars, but one sloppy attempt through single-player was successful. That's not right. For a game that clearly embraces wacky fun and the party atmosphere, I don’t understand why progress is blocked by a star system. It would be a much better (and less stressful game) without it. Don’t let these unnecessary roadblocks scare you off. 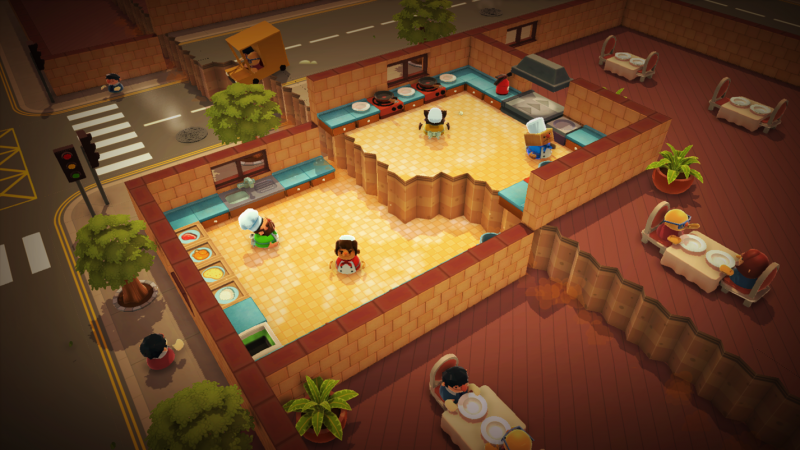 Overcooked is a wonderful local co-op experience, and a party game that hits all of the right notes in turning friends against each other and making even the quietest people scream uncontrollably. A fine example of four-player cooperative play.